The land borders on three picturesque lakes and has a creek meandering through at the foot of what is known as “The Mountain.” The forest, meadows, fields, marshlands and a fresh water spring, along with several high lookouts with fantastic views are just some of the special places. Wildlife abound, such as white tailed deer, bears, coyotes, beaver, otter, porcupine, fisher and more. Bird watching, hiking, picnics, four wheeling, hunting, camping and foraging for the wild edibles, when in season, are just some of the activities that take place on the farm. We Martins pride ourselves on the fact that there has never been any chemicals, herbicides, or pesticides on Shady Mile Farm. In years past there were homesteads around the perimeter. To prove the existence of farms and mountain men, remnants remain today. Trees of all kinds dot the landscape, but most importantly, and best of all, are the beautiful and giving sugar maples. After a long hard days work my great great grandparents would lie in bed in their log cabin listening to the dripping of the sap as it reached the buckets. 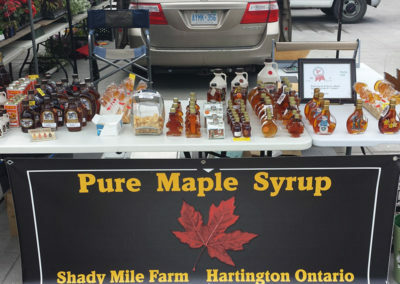 It was music to their ears, maple syrup, maple sugar on the way! The maple sugar bush is scattered in different areas throughout the farm with the roots firmly planted on lovely flat reddish sandstone. It has been told to me, by some old timers, that the best maple syrup comes from the sugar maple that grows on sandstone. For all the years, except for the last two, the trees have been tapped the good old fashioned way. Now I have pipelines, so it has grown bigger and better with plans to expand and put the pipeline to more trees in the future. The sap gushing into the stainless steel holding tanks from the lines is such a wonderful sight to see and a sound of music to the ears.. 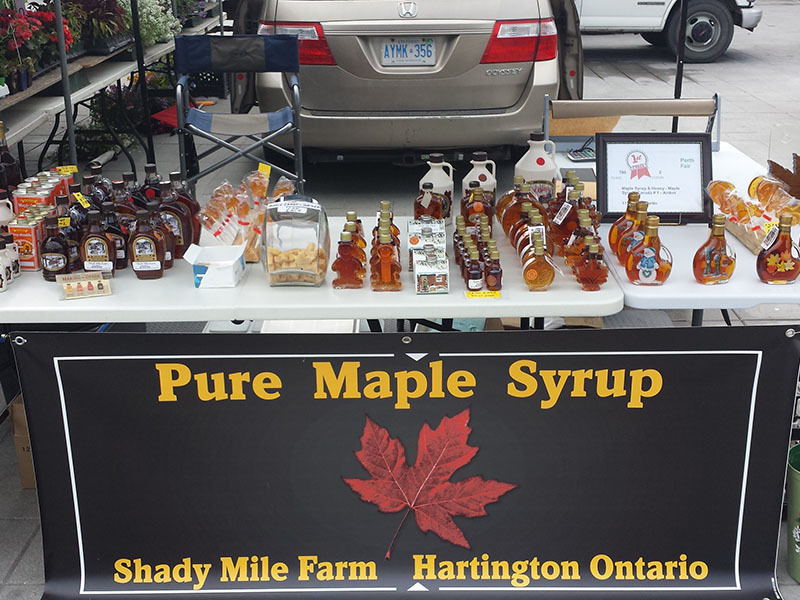 If you want some high quality, very tasty syrup, the best I think, then buy “Shady Mile Farm Maple Syrup” from the fifth generation owner and operator, Scott Martin.